A two-story luxury condo in Manhattan has just become the most expensive apartment ever sold in New York City. The as-yet-anonymous buyer plunked down over $100 million ($100,471,452.77, to be exact) for the unit, located on floors 89 and 90 of the tony One57 building, which overlooks Central Park. Do you think the posh pad was worth the dough? The 10,923-square-foot condo is housed in the luxurious mixed-used building on West 57th between Sixth and Seventh avenues. At 1,000-feet-tall, One57 is currently the tallest residential building in the Western Hemisphere – at least for the time-being. Photos of the record-setting condo in question were not available, but one can begin to imagine its potential splendor by gazing upon images of some of the other units in the building, as well as some of the amenities shared by residents. The gorgeous indoor pool is just one incredible feature, and all of the apartments have spectacular views of the city. One57 was designed by Pritzker Prize-winning architect Christian de Portzamparc and, due to its scale, is featured prominently in the Manhattan skyline. A hotel takes up the lower floors of the building, while the upper floors (which have their own entrance on West 58th) is completely residential. The other penthouse condo in the building will be up for grabs soon, but word on the street is that it will go quickly. Billionaire hedge fund manager Bill Ackman invested in flipping the one-story condo last October, and it’s expected to fetch $90 million once complete. That anticipated sale was supposed to set the real estate record, but this $100 million deal managed to grab the title first. 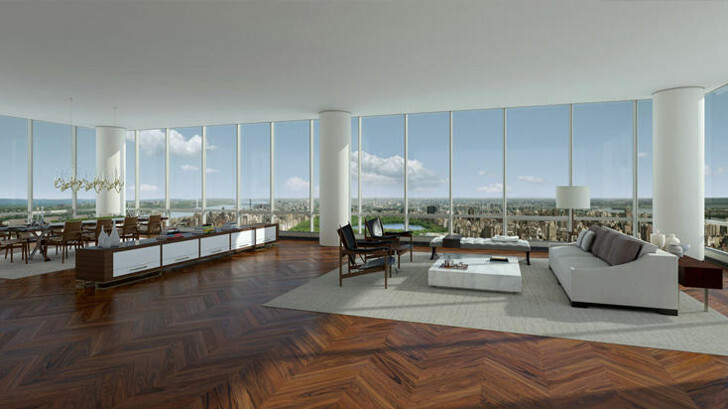 Ackman’s pet project is a 13,500-square-foot duplex named the Winter Garden for its curved glass atrium. It also features six bedrooms, eight bathrooms, and a panoramic view of Central Park. Incredibly, there are some slightly more affordable units available in the building at the moment. For the bargain price of $10 million, you can snag a two-bedroom condo just a few floors below the unit that commanded the record-setting sale.